Moon Chase! » Blog Archive » Sailor Moon Anime Seiyuu and Staff Update Spring 2010 – Part 3! Sailor Moon Anime Seiyuu and Staff Update Spring 2010 – Part 3! One Piece Celebrates Tenth Anniversary! 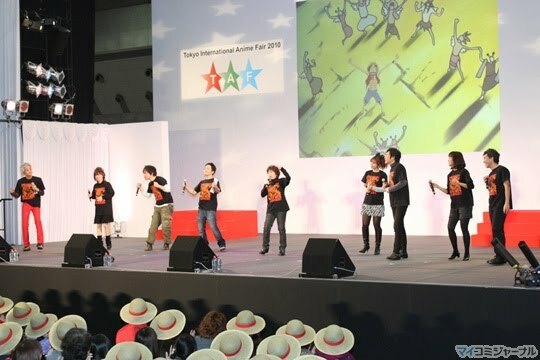 On March 27th, a special event was held at the 2010 Tokyo Anime Fair to celebrate the 10th anniversary of One Piece. Two Sailor Moon Seiyuu with roles in the anime were in attendance: Ikue Otani (U-Chouten and Sailor Tin Nyanko/Nyanko Suzu) who is the voice of Tony Tony Chopper and other characters, Kazuya Nakai (Oranja and Ittou Asanuma), and Mayumi Tanaka (Robert), who is the voice of Luffy! The thousand lucky people who were there to attend all got straw hats just like the one Luffy wears! The manga has sold 300 million copies to date, and the 57th chapter was just published. Here’s to many more, One Piece! In March, there was a second Fans’ Thanksgiving event for fans of the popular gaming franchise Ar Tonelico. The latest game in the shojo RPG franchise Ar tonelico III: The Girl’s Song that Pulls the Trigger of World’s Demise was released in January for the PS3, and sold over 81,000 copies in its first week! Ikue Otani is the voice of the villain Mute, a girl with a monstrous and hideous appearance who still maintains her femininity. The first Fans Thanksgiving event was held in October, and Bandai-Namco games decided to do another one just a few months afterwards to celebrate the immense success of the latest game in the franchise. Ikue felt like she was playing a character half in her grave because of her character’s grotesque bony and sinewy appearance. There was also a raffle at the event where fans could win prizes such as merchandise emblazoned with the game’s logo and characters, and a book signed by the cast. Arisa Mizuki Admired by Women, In a New Haircare Commercial, and Reprises Her Role in a Sequel! In an Internet poll held in the month of January, single women were asked which female talent they admired most. Arisa Mizuki is best known to us Moonies as the singer of the last theme song of Sailor Stars Kaze Mo, Sora Mo, Kitto (The Wind, The Sky, Still), and she was chosen in third place with 5.9% of the vote! Arisa is also in a new commercial for a haircare line from Shiseido – Tsubaki Head Spa. Her commercial is the very last one on this page. This shampoo has a blend of essential oils to bring out the best in your hair. She was featured with 5 other actresses in these commercials and appeared alongside them at a special event to celebrate the product’s launch in Tokyo (featured in photo here). And finally, Arisa is reprising her role as the namesake housewife in a second Sazae-san special to be broadcast sometime this summer. This special is being produced in celebration of the 50th anniversary of the popular manga about a Japanese woman striving to be the most modern housewife that she can be. 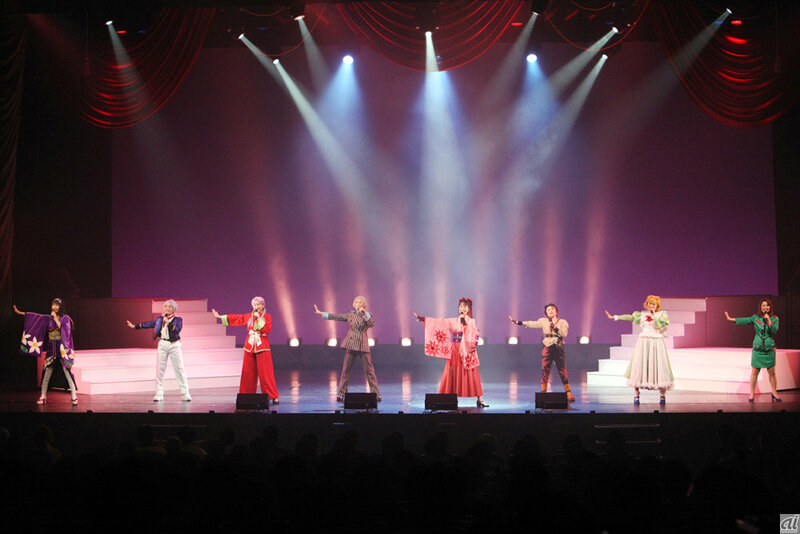 Many Seiyuu Cosplay and Sing at Sakura Taisen Concert; Out Soon on DVD! Michie Tomizawa (Sailor Mars), Kazue Ikura (Natsumi Ichinose, Bonnone), Kikuko Inoue (Princess Rubiina, Reiko Aya/Sailor Aluminum Siren), Mayumi Tanaka (Robert), Taiki Matsuno (Pegasus/Helios), Kumiko Nishihara (Diana), Yuriko Fuchizaki (Cyprine) and Toshio Furukawa (Hawk’s Eye) were all in full cosplay and singing hit songs from Sakura Taisen at Sakura Taisen Teito Hanagumi Live 2010 in Tokyo on March 6th. The concert was held in two parts, one during the day and one at night. This was the first Sakura Taisen concert event held in four years, and it was a wonderful reunion for the stars as well as for the fans. The show was so successful that it will be released on DVD in June. For more photos of the event, check out this post from Gamespot Japan. The one we have posted here features a few of the Sailor Moon Seiyuu – Michie Tomizawa is on the left, next to her is Kazue Ikura, and third from the right is Mayumi Tanaka! Kikuko Inoue Flies Again in Radio Drama, and Shows Up in a Ton of Other Places Too! Almost 7 years ago, Yahoo Japan embarked on an ambitious project to show English-dubbed anime shorts with Japanese subtitles. While we don’t know how this turned out, one of those properties is experiencing a resurrection through a radio drama in Japan. Trip Teck is a story about a young girl named Zocco who is the daughter of a Mighty King and a simple human woman. Her mother has been gone out of her life for reasons unknown, and she begins a journey to look for her. Accompanying her are two animal companions, a rabbit named Mimime and a fly named Catherine, who is played by none other than Kikuko Inoue. Sailor Moon fans may remember Kikuko as the voice of Sailor Aluminum Siren/Reiko Aya and Princess Rubina. In a new interview with the stars of the drama, she thought it was difficult to have to play a fly that advises Zocco on her journey, because who listens to flies? ITMedia has also gone a step further and posted photos of the actors recording their lines, something we hardly ever get a glimpse of! We’ve featured a shot of Kikuko working hard here! She hopes people will tune in because the show takes listeners to a completely new world and she feels that people will think that this is their journey too, and not just Zocco’s! For all you Metal Gear Solid fans, Kikuko also has a role as a new character named Chico in the upcoming game for PSP, Metal Gear Solid: Peace Walker. All we know about this character is that the character Amanda is his older sister. Kikuko is also voicing a commercial for a computer store advertising some sort of Intel replacement program at their store. Trading in certain desired processors and motherboards gets you a lottery ticket to win store credit towards a new machine. And those of you planning to purchase a MAPLUS GPS system in Japan, Kikuko is one of 17 popular actors chosen to record voices for the navigator, so the next time you take a wrong turn and your GPS takes forever to “recalculate” the distance, at least you can imagine Sailor Aluminum Siren contemplating a new route for your evildoing trip. And our very last Kikuko sighting for now is an appearance of her at an event for Rio Super Carnival, an anime based on a popular pachinko character (who later appeared in a Dead or Alive game). And here we thought Toru “ToFu-san” Furuya kept us too busy when this blog first started, and now it seems that Kikuko is the new hot star that’s out and about everywhere in Japan! This entry © Moon Chase. Written by sailordees and posted on May 5, 2010 at 3:47 am and filed under Appearances, Arisa Mizuki, Concerts, Ikue Otani, Kazue Ikura, Kazuya Nakai, Kikuko Inoue, Kumiko Nishihara, Mayumi Tanaka, Michie Tomizawa, Taiki Matsuno, Toshio Furukawa, Yuriko Fuchizaki. Bookmark the permalink. Follow any comments here with the RSS feed for this post.